Each year we unite a citywide ensemble of approximately 30 CPS students, their English teachers and professional CST artists to produce an original, ensemble-devised abridgement of a Shakespeare play. The students recruited for CPS Shakespeare! are not selected for their theatrical aspirations, but rather for their potential to benefit from the experience. Through more than 100 hours logged during six weeks of rehearsals, these students grow together, providing mutual support for risk-taking, creative expression, personal exploration and academic development. Their work culminates in two public performances in CST’s Courtyard Theater. CPS Shakespeare! alumni have gone on to academic and artistic success in their chosen fields. Some, such as Tony Vega and Warren Baskin, have even returned to the Theater to work in a professional capacity. For the past two summers, Tony has worked as the Assistant Project Manager for Chicago Shakespeare in the Parks, helping to inaugurate and grow CST’s initiative that brings free professional Shakespeare productions to neighborhoods across the city. 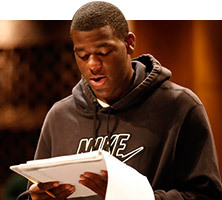 Warren, a three-time participant of CPS Shakespeare! and now a senior at the University of Illinois in Chicago, returns to CST this year as the CPS Shakespeare! intern. He says, "I just remember CPS Shakespeare! as a whole was really a life-changing event for me." CPS Shakespeare! Othello runs Friday, November 1 at 4:30 p.m. and Saturday, November 2 at 10:30 a.m. in CST's Courtyard Theater. Tickets are $5 and may be purchased by calling Chicago Shakespeare Theater's Box Office at 312.595.5600 or visiting www.chicagoshakes.com/cpsshakespeare. Help keep Shakespeare alive and well in Chicago—your tax-deductible gift supports the work on our stages, in the schools and communities, and across the globe!